Midlands Air Museum just south of Coventry. Easy to get to and easy parking (Motorhomes). Vulcan bomber Tours with its nuclear weapons. Interesting visit with many different planes to view some you can enter. Heritage Motor Museum nr Gaydon, Warwickshire. A great visit or stop off point on a journey for a good 3 hours. Reminiscing all those cars that we used to see - depending on how old you are. Easy parking for Motorhomes. Wythall Caravan Club Site. Large site good for getting into Birmingham by car, bus or train. Usual excellent shower block facilities. About half a mile walk to a good farm shop and restaurant. No pubs but a bus transport museum located next door. You don?t have to travel far to reach the green countryside. 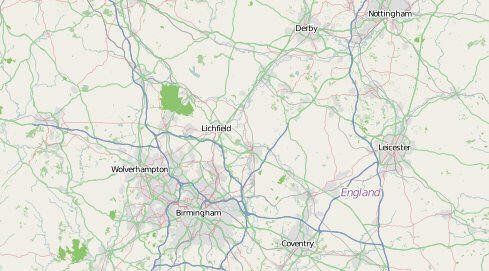 To the North West, 3 miles west of Wolverhampton is The National Trust Property ? Wightwick Manor and Gardens. The house s furnished with William Morris fabrics. Many National Trust properties have good parking facilities but please be thoughtful of other users ? try to park in areas of the car parks that won?t hinder others. Birmingham itself offers the Birmingham Eco Park, Birmingham Museum & Art Gallery, Cadbury World, Ikon Gallery, Musuem of the Jewellery Quarter, National Sea Life Centre, Royal Birmingham Society of Artists Gallery, Think Tank, Tolkein's Birmingham. Also check out Aston Hall, Midland Air Musuem at Baginton, Cadbury World and Selly Manor at Bournville. Castle Bromwich Castle Bromwich Hall Gardens, Coventry Coventry Cathedral and Herbert Art Gallery, Dudley Black Country Living Museum, Black Country Living Musuem, Dudley Musuem & Art Gallery and Dudley Zoo, Edgbaston Birmingham Botanical Gardens & Glasshouses, Kingswinford Broadfield House Glass Museum, Walsall New Art Gallery and Walsall Leather Musuem, Wolverhampton Bantock House & Park and Wolverhampton Art Gallery.